THE WRITING BUDDHA - Opinions | Books | Movies: Gumrah by Ira Trivedi (Book Review-3*/5) !!! 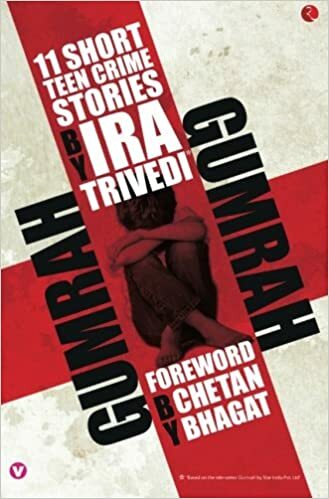 I am just done reading Ira Trivedi's latest release which is an anthology consisting of 11 short teen crime stories named "Gumrah". It is based on the popular tele-series Gumrah by Star India Pvt Ltd. The book basically focuses on adolescent crime, deceit, treachery and bad judgement. Ira has used a very simple language while writing this story so that the children in school can also understand what's happening with the characters. The book is written as fiction stories rather than documentary. I feel this is a good approach as it sounds interesting currently otherwise many would not have picked it up considering it to be a boring stuff. Each story is based on different emotions and conditions hence not making it sound monotonous after a while. The book is around 200-pages and can be easily completed in a sitting of 3-4 hours. The cover page is also appealing. Talking about the stories, Ira have made it clear in each of them that awareness has to be there in a child while making new friends and giving someone the authority of your life. She is asking everyone to "Be Aware, Be Prepared, Be Safe!". And I feel that the way juvenile crimes are increasing in the nation currently, this book can be a good way of letting the teens know the consequences of committing a crime in anger and later on, getting affected for lifetime because of it. This book can surely influence their minds. Coming to the drawbacks, I would say that authoress should have added some advice from her behalf too which could have been like a personal message to the readers. They could have understood the premises more clearly. Some may end up reading this book as a crime thriller with tragic endings and nothing else. That's the only issue with this book written with a great purpose. And I hope this book brings Ira Trivedi back into the writing foray as she has been away since a long long time. I give this attempt 3 stars out of 5.